No Government Has Ever Survived a Debt Crisis !!!!! Question: Has any government ever survived a debt crisis? The answer to that is ABSOLUTELY no. This is simply how government always die and we do not speak Latin, Ancient Greek, Ancient Egyptian, Ancient Chinese, or Ancient Babylonian. They have ALWAYS, and without exception, used the same Obama Logic going on right now. They have routinely seen themselves as the exception to history. Such arrogance knows no bounds. Why did we build the largest coin collection in the world? Because coins are the documented history of the fiscal mismanagement of centuries of mankind. There is nothing that does not fluctuate even what is used for money. During the late Roman Empire, a silver Miliarense was introduced by Constantine the Great (307-337AD) in his monetary reform. The silver Argenteus (meaning silver in Latin) issued by Diocletian (284-305AD) after the collapse of the monetary system, once again became debased so by 308 it had fallen from 92% pure down to about 40%. Thus, a new denomination was introduced the Miliarense at 4.29 grams but with a bigger flan (diameter) compared to the original Argenteus of 3.29 grams. By the reign of Leo I (457-474AD) the Miliarence vanishes in Europe yet is still produced in the East. However, the economic stress is evidenced by the fact that in the West the Miliarense was struck at 4.29 grams and in the East at 5.4 grams. A two Tier monetary system was emerging from the time of Constantine. Coinage was showing Rome was splitting 100 years in advance. The last Emperor of Rome, Romulus Augustus (475-476AD) had but four denominations. The silver had fallen to tiny coin of just 0.87 grams and the bronze collapsed in weight and size from 10 grams to just 0.61 grams. Silver and bronze vanished from circulation. Even the Barbarians imitated gold coins of the East. Within the core parts of Europe, gold began to disappear. This spread like a slow disease northward. Eventually, we begin to see even the Anglo-Saxons in Britain melting down Roman gold coins and importing gold in order to issue their coins. 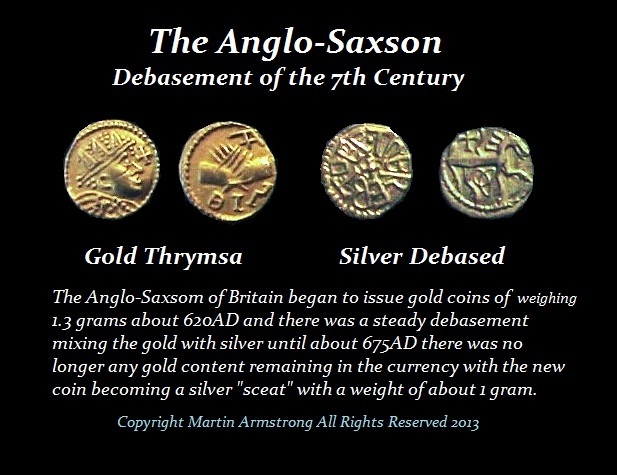 Here we see Anglo-Saxon coinage that fills the gaps even when history has not been recorded. The collapse of the monetary system where gold vanishes took place yes – in just 51.6 years. By the late 7th century, there is no longer any gold to be had. The coinage is then replaced with silver. It is the father of Charlemagne, Peppin (the short) (751-768AD) who reforms the monetary system introducing the “Denier” – the restoration of the Roman Denarius. 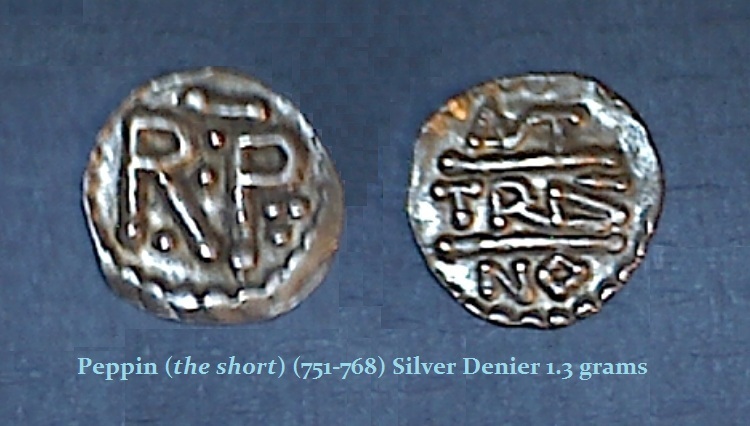 Silver then is the only form of coinage until gold reappears again in the 13th century. So there are periods where there is no gold and periods when there is no silver. These conditions have lasted for hundreds of years. Just because there have been gold coins, does not mean there was a fixing of value to create a gold standard. There have been hundreds of different experiments regarding monetary systems, that have used other things as money besides precious metals and at the same time there have been all sorts of attempts at regulating the flows of money. 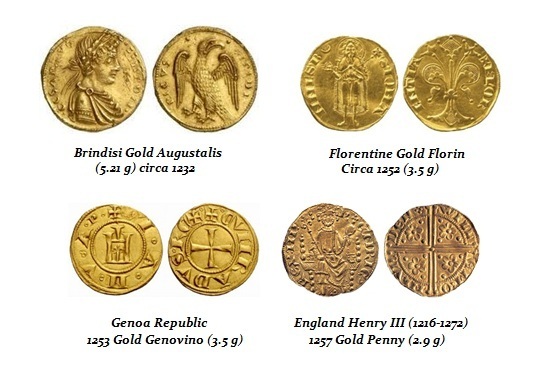 In Florence, they regulated a two-tier monetary system whereby local expenses and wages were to be paid ONLY in silver, while international trade was conducted ONLY in gold – the Florin. Yes – this broke down when the divergence between silver to gold blew out (silver-to-gold ratio) that led to massive riots and the burning down of the houses of bankers. Sound familiar?